For a man that spent the majority of his twenties working on nightclub doors and fighting in cages on his weekends, you would think speaking in front of a couple of hundred people at the RDS on a Friday morning in Dublin would be a fairly straightforward, routine task for a man like John Kavanagh. 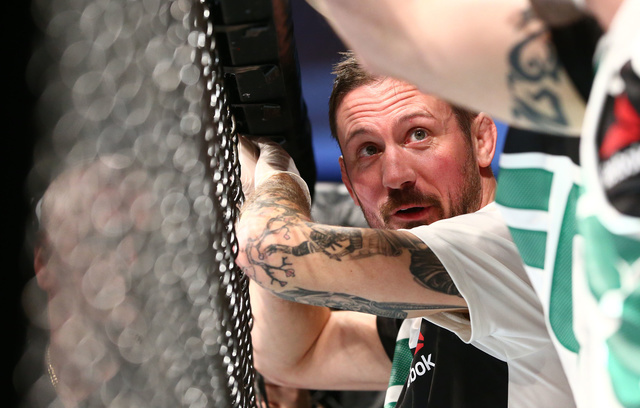 The SBG coach is seemingly the authoritative figure on all things Irish MMA and as president of the recently formed Irish Mixed Martial Arts Association, he is the figurehead, spokesperson and voice for the sport in Ireland. However, despite his knowledge, stature and approachable demeanour, Kavanagh has a tendency to shy away from the spotlight, particularly when it comes to public speaking. “I don’t like public speaking,” Kavanagh told the Sunday Independent’s Paul Kimmage less than one week before the One-Zero Conference in Dublin. “I’m comfortable with this but I don’t like a lot of people looking at me when I’m talking. I also have a skin condition, a very bad rosacea, which means that if I get nervous at all, this redness comes up around my neck, and I’m talking putrid red. So here he is at a conference hall in Dublin. The man who hates public speaking more than just about anything else is about to take to the stage to talk in front of hundreds of people, discussing a range of issues, both personal and professional, with Richard Barrett, COO of Pundit Arena and co-organiser of the One-Zero Conference. Kavanagh is dressed in a sharp grey suit and even looks like he may have paid a visit to Conor McGregor’s tailor, David Heil, for his conference attire. After sitting down at centre stage, Barrett and Kavanagh begin discussing a range of issues including the coach’s humble beginnings, his philosophy on teaching, and how a Dublin woman in her mid 60s convinced him that MMA was really starting to take off in Ireland. I’m sitting in the front row, just to the side of the stage, jotting down a few notes that I think might be of use for later, but it’s not until Kavanagh starts talking about his obsession for MMA that I really sit up and take notice. From afar, it may seem as if Kavanagh is the mild-mannered introvert behind the ultra-brash, wildly affluent and highly confident Conor McGregor, but on closer inspection you can see how these guys connect. They’re obsessed with their sport and all of its finer intricacies and minor details. 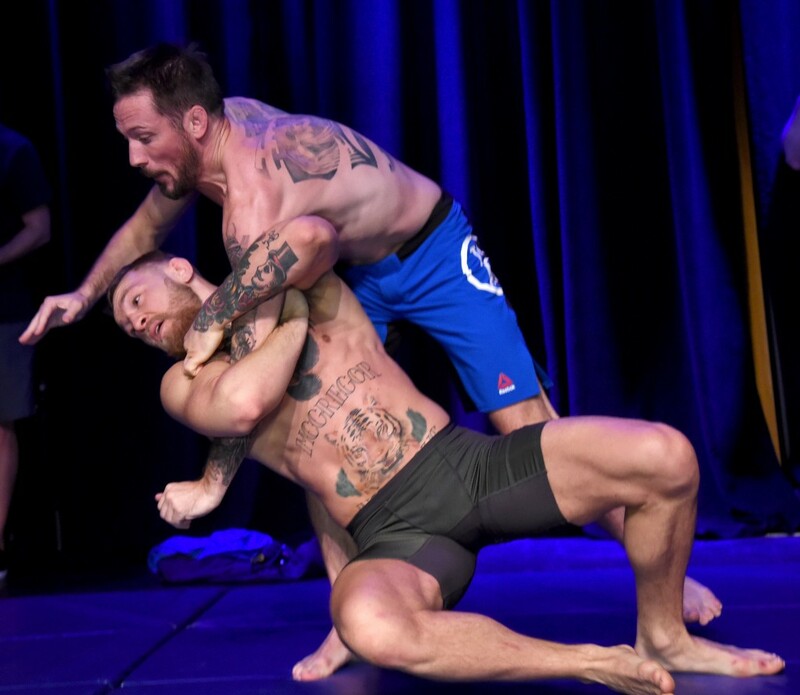 “People who start getting into MMA for whatever reason, it starts to become an obsession fairly early on,” Kavanagh said at the conference. Kavanagh’s whole MMA career has been a mixture of trial and error. From running a gym with no central heating, affectionately called ‘the Shed’ in Phibsborough, to running another premises that was literally built around a tree, Kavanagh has seemingly always had to overcome different obstacles to keep his dream alive. Whether it was constantly badgering the UFC to try and get an Irish fighter (Tom Egan) on the first Irish UFC card in Dublin in 2009, or desperately trying to keep his gym afloat by limiting his overdraft to just €2,000, Kavanagh has been battling for most of his adult life to keep his MMA dream alive. That dream turned into a reality two years ago when four SBG fighters won at UFC Dublin in July 2014 to solidify Kavanagh’s team, country and credentials as a coach, but also to legitimise his sport to Irish fans, the wider sports world and his parents, who had always been skeptical of what he had been doing with his life. That famous night in Dublin was one of the highlights of Kavanagh’s professional career and it was no accident. It was the culmination of years of hard work and perseverance to fulfil a burning desire to master his craft. “You get very narrow-minded about what you find interesting,” added Kavanagh. “I find it hard to watch a full movie without taking my phone out and watching something about technique or something in the MMA world. “It’s not 9 to 5. I’m in the gym pretty much all day. I wake up early. The first few hours are spent catching a bunch of emails and messages sent during the night. You get home at 10 o’clock and the next two or three hours are doing the same thing. If you’re going to do something like this, it’s almost a vocation. This notion of being fully invested is something that Kavanagh preaches to his fighters and all that enter his gym. To him, you have to have the dedication and commitment above all else to succeed, but you also have to have patience. “To be a high level professional athlete – like I said, I can only speak from my experience – it has to be all about you. From the minute you wake up to the minute you go to sleep, it’s just about yourself. “When I started off I was working security five nights a week and construction at the weekends, just so I could train Monday to Friday and pay the rent and try and keep this idea going. “But for someone who shows and has a decent background and is young enough that they are going to get somewhere with it, the only thing I’m interested to see is are they enjoying it. “Because whatever it is you want to do, I don’t take care it what is, it’s going to take you ten years of doing it daily before you get anywhere. “No matter what you want to get to an expert level at, you have to put in the time. “To be an athlete in our sport, there’s no seasons, it’s twelve months long, and, depending on how your body holds up, you have five to seven years from making your UFC debut to when you retire. Kavanagh may have to worry about the commitment and work ethic of some of his students, but not McGregor. The coach’s prized pupil is famously the only SBG member with his own key to the gym, such is his restlessness to be able to practice and train at any time he finds inspiration. 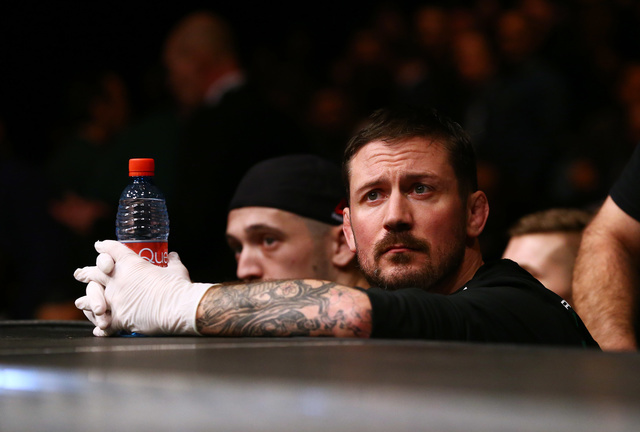 For Kavanagh, who was a former fighter himself, he’s now at peace with his role as a coach and a cornerman, and he finds solace in the methodology and preparation for a fight – win, lose or draw. “When you do walk to the cage, when you sit down and they walk in, it’s very tough because you get such bad anxiety because you’ve lost control,” added Kavanagh. “It’s kind of like being a passenger in a car where you get a bit more nervous because you don’t know what the driver is going to do. “When you drive yourself it’s okay but I come up with a very, very simple technique where I just sit in the corner, get really good posture, take a deep breath and just say ‘I’ve done all that I could, now it’s his time’. “I think when you put everything into the training there is a sense of relaxation walking towards the cage. Conor uses the analogy it’s a bit like taking the shackles off walking towards the cage. “Although he’s really good at it, he’s a lot more fond of the fighting than he is of his media ability. What really got us interested in this sport 15 years ago was the physical problems of another human being and trying to make your style beat their style, that’s somewhat the fun part. “I tell my fighters if you’ve had some bad food on the weekend, if you’ve partied a bit or if you skipped a few training sessions, there’s no motivational talk I can give you backstage that’s going to override that little voice in the back of your head. When it’s two in the morning and you’re lying in bed you can’t lie to yourself, but when you’ve done all you can then you can live with the consequences, or you can live with the result. McGregor has had a decorated history of giving it everything and more, and he’ll get another chance to display his heart and grit when he takes on Eddie Alvarez at UFC 205 in November. McGregor will headline the first ever professional MMA event in New York on the night and joined beside him, under the brightest of spotlights, will be the man that does his very best to shy away from the spotlight… prepared, calculated and as committed as ever.